Do you know — Your Smart Devices may have inadvertently participated in a record-breaking largest cyber attack that Internet has just witnessed. 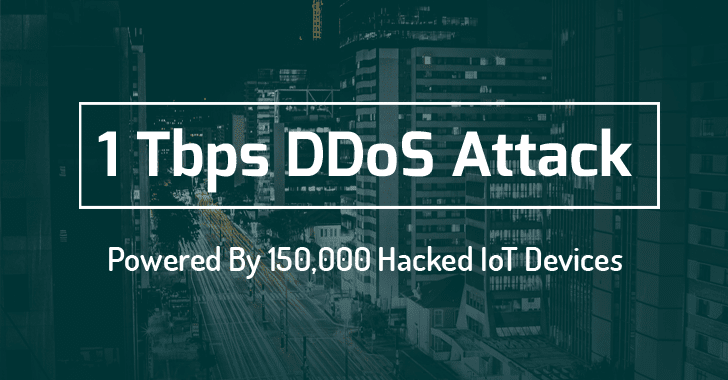 If you own a smart device like Internet-connected televisions, cars, refrigerators or thermostats, you might already be part of a botnet of millions of infected devices that was used to launch the biggest DDoS attack known to date, with peaks of over 1 Tbps of traffic. France-based hosting provider OVH was the victim to the record-breaking Distributed Denial of Service (DDoS) attacks that reached over one terabit per second (1 Tbps) over the past week. IoTs are currently being deployed in a large variety of devices throughout your home, businesses, hospitals, and even entire cities (Smart Cities), but they are routinely being hacked and used as weapons in cyber attacks due to lack of stringent security measures and insecure encryption mechanisms. Also Read: Here's How to Hack IoT Devices. Octave Klaba, the founder and CTO of OVH, revealed on Twitter last week when his company was hit with two simultaneous DDoS attacks whose combined bandwidth reached almost 1 Tbps. "Last days, we got [a] lot of huge DDoS. Here, the list of "bigger that 100Gbps" only. You can see the simultaneous DDoS are close to 1 Tbps!," Klaba tweeted. A screenshot posted by Klaba shows multiple DDoS attacks that exceed 100 Gbps, including one that peaked at 799 Gbps alone, making it the largest DDoS attack ever reported. According to the OVH founder, the massive DDoS attack was carried out via a network of over 152,000 IoT devices that includes compromised CCTV cameras and personal video recorders. IoT-powered DDoS attacks have now reached an unprecedented size, as it is too easy for hackers to gain control of poorly configured, or vulnerable, IoT devices. Late last year, we reported that lazy manufacturers of the IoTs and home routers are reusing the same set of hard-coded SSH (Secure Shell) cryptographic keys, leaving millions of embedded devices, including home routers, modems, and IP cameras open to Hijacking. These insecure IoT or internet-connected devices are no longer in line for security updates, which makes it possible for hackers to hijack these connected devices today or tomorrow.